This 4-cord polyester waxed thread is extremely strong and is perfect for crafts that require smooth and consistent thread that does not stretch or break. 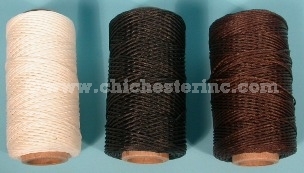 It is ideal for hand-stitching leather as well as for beading jewelry. There are approximately 175 yards on a 4-oz. spool. Click HERE for Leather Lacing.